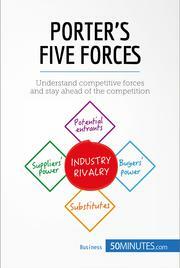 This book is a practical and accessible guide to understanding and implementing Porter’s five forces, providing you with the essential information and saving time. 50MINUTES.COM provides the tools to quickly understand the main theories and concepts that shape the economic world of today. Our publications are easy to use and they will save you time. They provide elements of theory and case studies, making them excellent guides to understand key concepts in just a few minutes. In fact, they are the starting point to take action and push your business to the next level.